I know everyone here in the DFW area still has the Texas Rangers “Pennant” Win from last season on the brain, but did you know that pennant images are totally “in” for crafters? I was at the Great American Scrapbook Convention over the weekend and saw samples and projects using pennants everywhere! Of course, Stampin' Up! is right in the mix. I found this fun project on our demo-only website. To make it, I used a new stamp set that I received for free!. (While I can't yet show you the new catalog or any of the new sets, I can post projects that have been created with these new stamp sets). There are so many reasons I love being a Stampin' Up! Demonstrator. Some of the best are all the exclusive projects, templates, and patterns that I can get on our website and the free products I earn! We recently named my group of talented stampers, Girls, Ink. Girls Ink has our next gathering on June 16th; if you have any interest at all in turning your love of crafting into a business why don't you join us for a fun evening and see why we love what we do! RSVP here. Fold Wild Wasabi Card Stock in half to create card. Stamp sentiment in Chocolate Chip ink on Wild Wasabi Patterns Designer Series Paper. Adhere two pieces of Chocolate Chip 1/2” Scallop Dots Ribbon to Wild Wasabi Patterns Designer Series Paper so that ribbon scallops are visible. Adhere to card front. Stamp pennant image in Baja Breeze ink on Baja Breeze Card Stock; stamp pennant image in Daffodil Delight ink on Daffodil Delight Card Stock; stamp pennant image in Pretty in Pink ink on Pretty in Pink Card Stock. Punch pennants using Petite Pennants Punch. 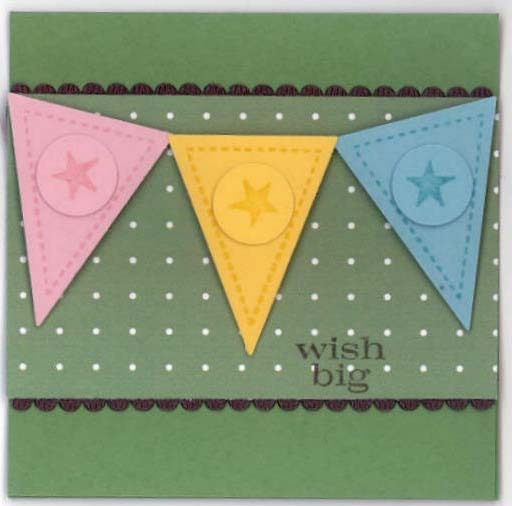 Adhere pennants to card front using Stampin’ Dimensionals. Stamp star image in Baja Breeze ink on Baja Breeze Card Stock; stamp star image in Daffodil Delight ink on Daffodil Delight Card Stock; stamp star image in Pretty in Pink ink on Pretty in Pink Card Stock. Punch stars from Baja Breeze, Daffodil Delight, and Pretty in Pink Card Stock using 1/2″ Circle Punch. Adhere stamped circles to pennants. girls inkscrapbookstampin up demonstratorStampin' Up! 23 Days Left To Get $25 MORE Free Stuff!